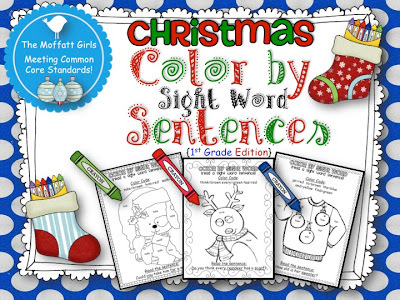 I am finally done with all of our Christmas Color by Sight Word sets and just in time for some FUN Christmas learning! 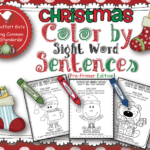 Since kids LOVE to color, this is a perfect way to meet Common Core Standards, practice sight words and have FUN! If you want to win a set for yourself, just leave a comment telling me which set you want (yes, you can pick the BUNDLE), leave your email and I will pick a winner using random.org tomorrow. The winner will be announced on our Facebook page. All Christmas items are on SALE! 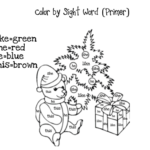 Christmas Color by Sight Word Sentences! I would love to win Sight Word Sentences!!! My students and I love all of your activities. Thank you! I always love your work and so does my students!!! I would love to win Sight Word Sentences! They look awesome! I would love to win the bundle if that is an option?! Love it! thanks for all you do!! BrannanKJ@gmail.com is my e-mail, opps! My kids need lots of sight word practice ! I love these ! I would love to win the sight word sentences. My kids would love them! Love your stuff! It is all awesome! I would just love the First Grade packet!! What a great resource! I would LOVE to win the bundle. My professional development plan for this year is to increase sight word fluency and this as a center activity would definitely help my students with building their sight word fluency. I LOVE all your products and stocked up on many during the TPT sale, but I had to draw the line somewhere, so this bundle is on my wish list. Thanks for all you do. I would love to win the bundle. i would love the first grade set! thank you! Definitely would love the bundle so I could use it with more students. Your work is wonderful!! Ooohhhh…I would love to win the bundle! Naturally I would love to win the bundle. Your work is the best! Thanks so much! I would love to have the primer edition! I would be a very happy kindergarten teacher if I won your bundle edition! Love, love, love all of the purchases that I have made so far. Thank you for sharing all of your work. Hoping to win the bundle! I would love to win the bundle. My students love activities like this. Thanks for creating so many great resources . My daughter loves these so much. She is doing incredibly well with the Ready2Read program. I know she would have a great time with these!! I would love to win the bundle! This would be an excellent activity for my students. 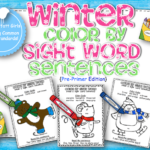 Colors AND sight words!! I would love to win the whole bundle. I think my first graders would really love these. Thank you, now I just have to be lucky enough to get the sight word sentences for 1st grade. I would love the bundle! I would love the bundle!!! 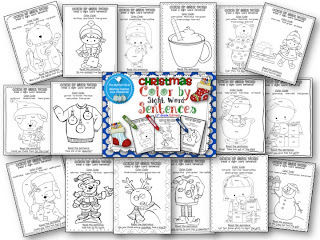 Do you have a kindergarten set like this… christmas themed?? i would love to win sight word sentences! I would love to win the bundle!! I would love to win the Bundle! Thank you for providing this wonderful giveaway! We love your products! 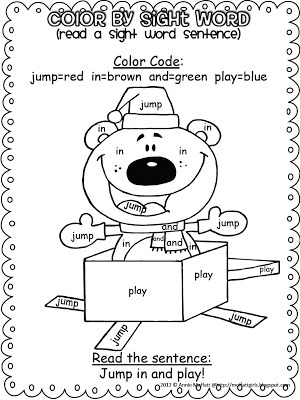 I love your sight word activities for my 1st/2nd grade special education class! I hope I win the first grade set! I would definitely want the bundle! These are so cute and my first graders would love them! I would love the per-primer bundle!!! What a great idea!!! i would love to win the bundle!!! i love your worksheets! i would love to win the first grade set! thanks! I would love the bundle!! So wonderful! I LOVE these and would LOVE to win the BUNDLE! I use the ready2read with my new entrant class in New Zealand (I think in US they are kindergarten). Many thanks Annie you are awesome!!! Wow! I would love to win the bundle. Thank you so much! You are spot on with your creations. "All I want for Christmas is ….your bundle". Thank you for a chance at winning and have a wonderful Christmas season. Thank you. Have a wonderful Christmas season. I would love to win the bundle. 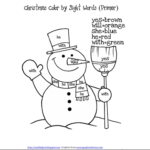 I teach special Ed k-2 and the just love it when I bring out your color by sight word pages! I would love the bundle! Thanks! My students love these. I would like to win the bundle. I would love the bundle. Thanks for the opportunity. I would love to win the bundle! As you asked us which bundle, and I can only find the one bundle, I'll choose an edition. I'm particularly interested in the pre-primer edition. What a wonderful giveaway! My students would love these. I would love to win the bundle! I would love to have the first grade one. My little kinders would love love love this set…oh yeah, and so would I! I would love to win the bundle! My girls would be so excited to do these. Our house has been a flurry of drawing activity as they realize that Christmas is approaching and this homeschooling mom might not feel so guilty letting them just create if their craft time also had some reading with it. :). Thanks for the chance! 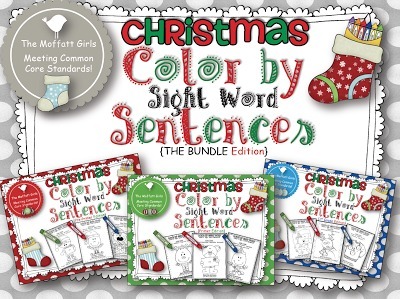 I would love to win the sentence bundle! We enjoy your products very much! I would love to win the bundle (ofcourse)!! The pictures are so adorable! My little girl would love them! And I will be happy too as she will be learning some new words while coloring!